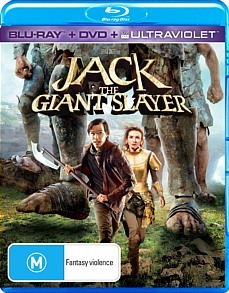 Cockneys vs Zombies Blu-ray Review Jack the Giant Slayer once again ticks all the right boxes from its outlandish dialogue, over the top action scenes and good old fashion Hollywood story telling that successfully re-imagines another children's fairytale. I'm going to get slammed by both my friends and critics but I thoroughly enjoyed Jack the Giant Slayer and compared to other Sword & Sorcery films, I actually enjoyed this more than Peter Jackson's The Hobbit. Sure, it's full of Hollywood fluff but there's actually some endearing fun in this action adventure based on the classic story of Jack and the Beanstalk. With that said, this Hollywood Blockbuster also parallels to the 1962 stop motion film entitled Jack the Giant Killer that like Hansel & Gretel Witch Hunters, this story successfully re-imagines this tale. 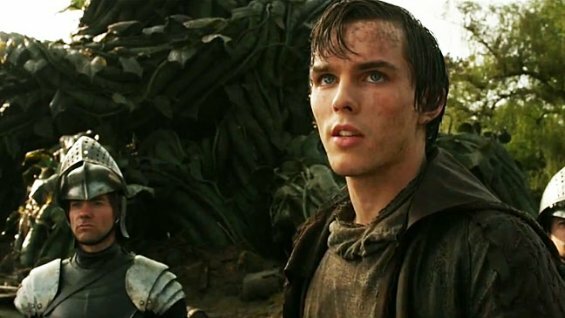 The story revolves around Jack (Nicholas Hoult) who unwittingly creates a link between the realm of man and the land of giants. Those familiar with the original story will be pleased to know that Jack is indeed given some magic beans which is regrettably releases during a violent thunderstorm. As a result, a giant beanstalk grows to the heavens and we all know what's waiting at the top... GIANTS! Unfortunately to compound the situation, this giant stalk has taken Jack's cottage and along with it the beautiful Princess Isabelle (Eleanor Tomlinson) to the heavens. Why was the Princess there? She ran away from the Castle as she does not want to marry Roderick (Stanley Tucci) who wants to become king... of course. 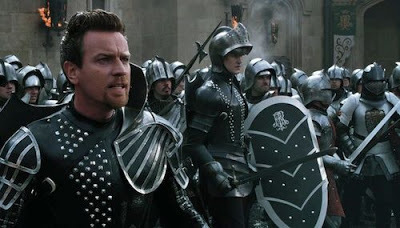 However as Jack is responsible for this disaster he volunteers to ride with Roderick and Elmot (Ewan McGregor) plus some of the other's King's Men to rescue the damsel in distress. But when they arrive at the end of the beanstalk, they soon discover that this land is overridden with Giants who despise mankind and from here, the action goes up several levels of intensity. However like all good Hollywood Blockbusters, the film ensure that all the right tick boxes are ticked that include brilliant special effects, action, romance and even comedy. 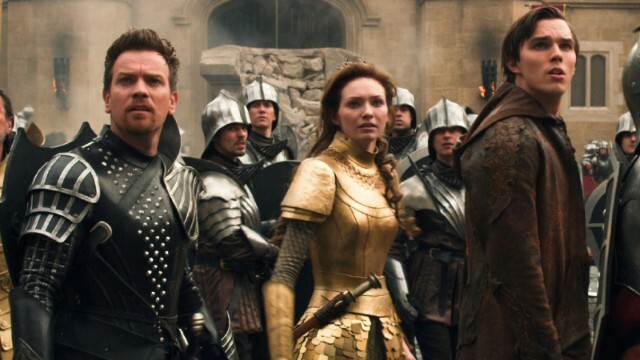 Jack the Giant Slayer is also directed by Bryan Singer who lends his professional directing abilities to this film which does create this rollercoaster ride from start to finish. Even though some of the characters are 2D (some of the Giants have more personality), there is still something enjoyable in this, especially newcomer Nicholas Hoult and of course Ewan McGregor. Just be warned that the dialogue is more 21st century than medieval times and surprisingly one of the giants even lets out the F-bomb (almost) when he dies. 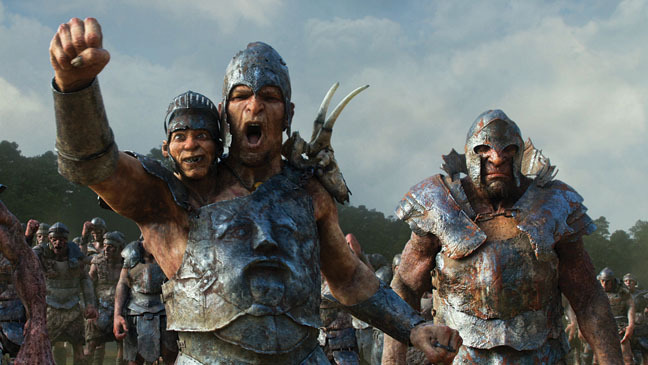 A special mention should be made to the giants who although look a tad cartoonish, look quite real for the majority of the film and their CGI creations interact quite well with the real actors. For a movie costing over $200 million dollars, the video looks spectacular on Blu-ray with super sharp images, vibrant colours and deep blacks. Audio is equally impressive with DTS-HS Master Audio. Special features include a fun interactive "become a giant slayer" experience (great for kids), deleted scenes and a very funny gag reel. The non 3D version of the Blu-ray also comes with the DVD version of the movie plus the ultraviolet copy. All in all, it's a nice touch to a rather entertaining film. If you're looking for a fun action adventure of the Sword & Sorcery genre than look no further. Jack the Giant Slayer once again ticks all the right boxes from its outlandish dialogue, over the top action scenes and good old fashion Hollywood story telling that successfully re-imagines another children's fairytale.